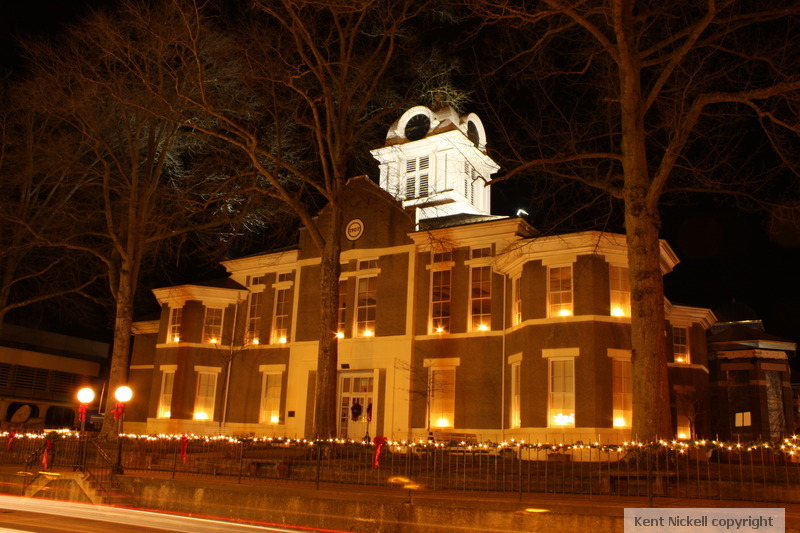 In the summer of 1979, I worked on a crew that started restoring the Morgan County Courthouse. It was my first summer of really hard work. My previous summers were spent as a life guard at the West Liberty Kiwanis swimming pool. Now some of you may think dragging yourself out of bed at the crack of 11:00 AM and rushing out to the pool to sit in the sun, listen to music, drink your fill of cold Cokes, and eating hot dogs, chips, and ice cream most of the day constitutes hard work, then so be it. Okay, maybe I left out the part of having to deal with screaming kids, cleaning filthy bathrooms, and actually being on guard to prevent those same screaming kids from drowning. The summer I spent working on the courthouse was a great summer. I was employed by a local builder and worked with a knowledgeable, professional, and hard-working crew…well, except for me. I will always be thankful for the patience they showed a former lifeguard with no experience in working at real man’s work. Even though I was the low man on the totem pole (can we say totem pole now in classic American literature such as this? ), it was a great summer job. Foreman to carpenter, “Bring ten of those shingle bundles up to the roof.” Implicit within these directions were the facts that the bundles weighed eighty pounds each and the roof was a ladder destination about fifty feet in the air. I can never say enough good things about the crew I worked with that summer. One thing they taught me was to finish college because I was not cut out for this kind of work. There have been many courthouses on this site. Built in 1907, this particular courthouse is on the National Register of Historical Places. Once condemned with a fence around it and awaiting a wrecking ball, a group of concerned citizens led the fight to save it. I’m glad they were there to save the building. As a young boy I remember the whittlers and knife traders on the courthouse square. I also remember the Saturday Night Jamboree from the courtroom. My uncle tells about having his tonsils removed in a make-shift operating room set up in the courtroom. On the night of the tornado, I was glad to see the courthouse still standing, knowing it had taken all the storm had to give. As I stood for a moment and gazed at the battered building, all of those memories of working that summer came back to me — I was filled with relief the crew had had the good sense to never let me drive a nail. 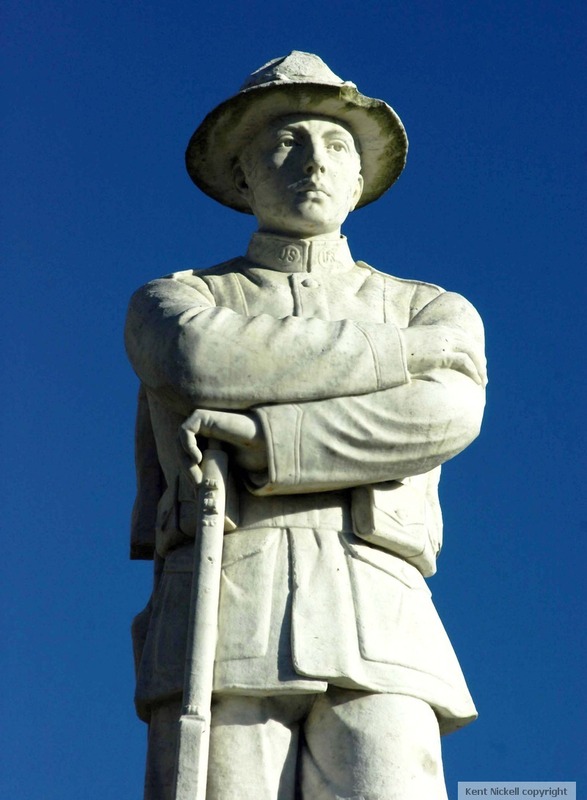 The Doughboy stood as a sentinel on the Morgan County Court House square for over eighty years. Since the 1920’s when he came to West Liberty, KY and began his watch over our community he had witnessed many changes and through it all he remained steadfast….until March 2, 2012. He had seen horse and buggies and A-models on mud streets through the depression. He witnessed young men, like himself, go off to war from the bus station across the street, knowing they were full of patriotism and a sense of duty mixed with a lot of anxiety and wondering if they would see their families again as they looked out the windows at the back of the bus. He silently rejoiced as most returned, victorious in battle. He also mourned for those families that experienced the loss and sacrifice of their sons. He saw the jubilation and carefree times after World War II and into the fifties as the cars going by changed from bulkier sedans to sleeker, longer styles, some having fins. He never blinked when the muscle cars of the sixties and early seventies sped by and he wondered if they ever noticed him. Recently he has seen helicopters fly in and out of the hospital on the hill across the Licking River. He saw many sixteen year-olds learning to parallel park on Main Street. He probably chuckled to himself as he saw one particular frustrated teen feebly attempt to perform this arduous task three weeks in a row in pursuit of his driver’s license. That name shall remain off the pages of these scholarly ramblings. I have taken many pictures of this World War I monument over the years. For some reason I have always been drawn to his face, having been struck by the lifelike features and youthful appearance. Whenever I would look at him, I thought of my grandfather who enlisted in the Navy near the end of World War I. He met my grandmother while in training at the Naval training center in Chicago. She was fifteen and he was eighteen. They eventually married and he brought her to West Liberty from Chicago. I admired her courage and her adventurous spirit. I like to think the Doughboy “fell on the grenade” that fateful night trying to protect the community he had watched over all those years. As he absorbed the direct force of the tornado that toppled him from his post and severely wounded him, I hope he felt the love and respect of the community for those many from Morgan County who have served this great nation and for whom he stood in honor. The Doughboy is being repaired and eventually will be back in the community he loves so dear. Like that officer that has earned a cushy desk job, he will be performing his duties inside one of the court buildings. I will be glad to see him back in town. I was born and raised in West Liberty. This is a nice small town in the foothills of the Appalachian Mountains in eastern Kentucky. Like all small towns across America, West Liberty has some incredibly wonderful people and some real characters. It was a great place to grow up and to be from. I have always been proud of my hometown. I always thought that West Liberty was the closest thing on earth to Mayberry, so much so that when my oldest child was getting ready to start school, my wife and I decided to move back to West Liberty to raise our children. You see my wife was not from West Liberty and she was moving away from her hometown area — it was not an easy decision for us at the time. I think growing up in a small town is wonderful, because you learn how to deal with people. You can’t isolate yourself like you can in a city. I think it is easier to take a small town raising and move to the city than vice versa. However I still had some reservations about this move because I thought I had become citified. I was reminded of the Gomer Pyle, USMC episode when Gomer came back to Mayberry on leave from the Marines and he wanted to surprise his friends only to show up and no one was there. Mayberry ain’t what it use to be. Those few lyrics did not prove to be the case with me because it was a smooth transition back home. However, it hasn’t been so smooth in these last six months since the tornado tore everything up. The buildings don’t still stand anymore and a lot of my friends I don’t see as often because routines have changed. I sometimes wonder if the tornado changed me also. I hope this is not the case. West Liberty will always be a wonderful small town and I know, again, it will be a great place to be from. 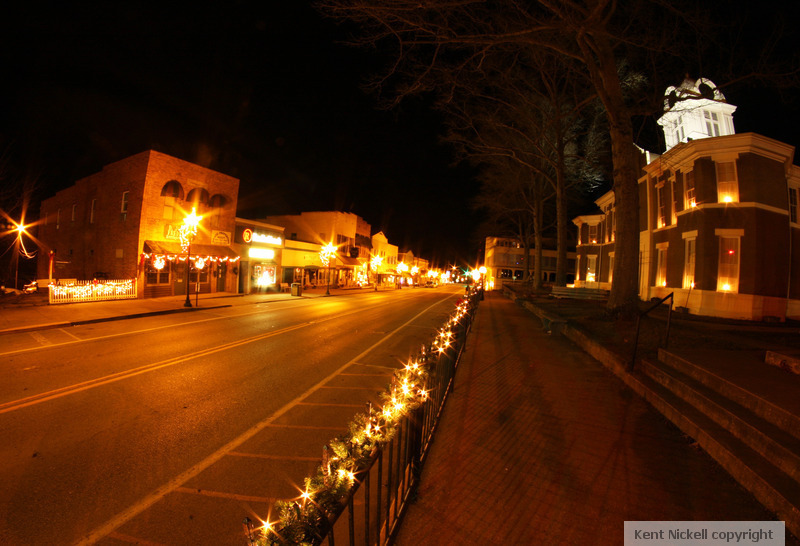 I took this shot of Main Street at night this past winter about two or three months before the tornado. Most of these buildings are gone now. I am glad to have this picture. Like looking at friends in old school yearbooks, it will be easier to remember what this old friend looked like. But as we all change from year to year in those photos, it will be great to see West Liberty fully grown up again. If you like this picture, you can see more here. I needed so badly to get out of town. I love West Liberty and it’s people, but a body can only stand so much post-tornado sights and insurance-slogging. I went to the only place on God’s earth that could give me respite…the beach. No one and I mean not one person in all of humanity enjoys the beach more than me! The only multitasking I do on the beach is drinking coffee while plopping in a beach chair. When I am at the beach, I morph into my alter ego…”Big Surf Daddy”. Big Surf loves to ride the waves. The biggest difference in Big Surf’s body surfing experience is that he has to sea pee more than in the past. He is thinking of getting a matching swimmer’s hat and trunks like the Olympians wear to help neutralize the added girth he has picked up in his sixth decade of life. Big Surf can’t wait until he is a little older and has lost a lot more of his inhibitions so he can promenade up and down the beach in a new thong. When he is too old to body surf at least he will enjoy other beach activities, like embarrassing your kids. (After reading this blog, he may have already accomplished that). Big Surf had trouble sleeping this vacation. I guess the tornado came with him this year. He could not escape it even in slumber. One advantage however in those sleepless times is being awake early enough to go out on the beach for some sunrise photos. Big Surf wishes he was a morning person because he loves sunrises, especially over the Atlantic Ocean. 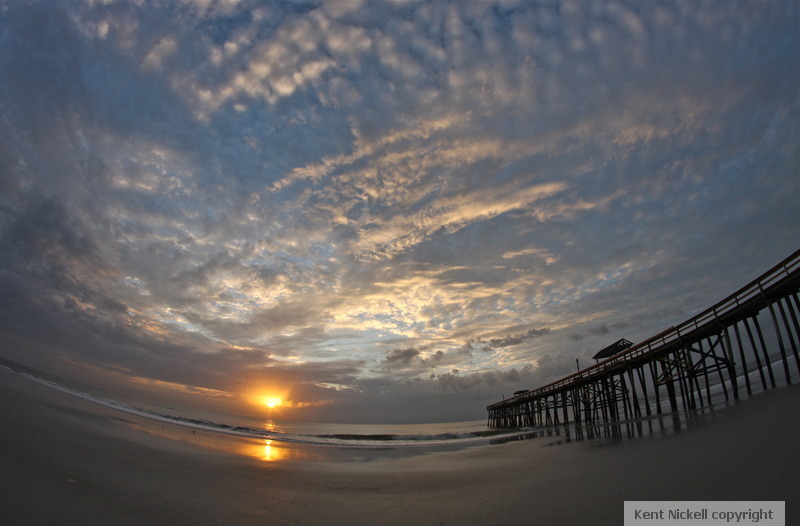 He dragged himself out of bed one morning and photographed one Amelia Island dawn. Alas, I was forced to leave. You could see the tracks in the sand where I was dragged by my wife and kids. I had to face my time of departure and with it say good bye to that inner beach-loving, shark tooth-hunting, late afternoon breeze-napping, drip castle-building, body-surfing, morning-walking, seafood-devouring, reggae-listening second self. See you next year, Big Surf. Sometimes you just have to get off the depression couch and go outside and put your face in the sun and thank God you are alive. That is what I am doing today. This photo always makes me smile, like Snoopy dancing on top of Schroeder’s piano. I got lucky when I took this picture. I was in Haiti, driving with my group back to the airport when one of our members wanted to stop and get some kind of sugar product. The rest of us had no clue what he was talking about or where we were, which was my normal state of mind in Haiti, but since he was Haitian and he seemed to like us, we did not fret about this stop. Also since there were ten of us riding in what was the equivalent of the back of a covered small pick-up, we welcomed the chance to pile out like clowns out of a Volkswagon. We pulled into this mango grove in a rural area of western Haiti. I saw some children playing so I grabbed my camera. This little girl and her sister were in a makeshift classroom and I guess they were on a break since the “blancs” showed up. I asked their mother if I could take pictures of them and she agreed. After taking a few shots, and I might add they were more than willing to cooperate, one of my collegues wanted to get a shot of the blackboard to see if we could interpret the French writing. My young model had a difference of opinion. She did not want to leave the view of the camera…so I did what only I could do and kept taking pictures. This was one of the shots and I loved it immediately. It has a strange composition and her expression is so joyful. Haiti is a difficult place to visit. It is hard to see people living in poverty and unsanitary conditions. However, I enjoyed the Haitian people and they taught me so much about being happy and joyful. I think anyone who has a chance to go and visit Haiti, should. I am not going to say it changed my life, but it made me more aware of the plight of the rest of the world and the hardships that others go through in their day to day lives and how we Americans take so much for granted. It helped me understand that Jesus loves all the world, not just Americans. We all could learn a few things from the Haitian people. I learned a lot from this young girl and she is still making me smile.